My heart literally sank when I saw this post about the latest Dora dolls. What happened to my daughter's best doll friend? Just the other day she was a happy-go-lucky exploradora and now she looks like she needs a few tamales! I may need to order "Yum! Mmmm! Que Rico!" for Dora for Christmas. Come on Fisher Price, you're killing us here! She's Latina: How many Latinas can a Latina watch on TV nowadays? I keep our cartoon watching to Noogin, so outside of Dora & Diego's sister, Alicia, that brings us to zero. She's adventurous: She's not afraid of a challenge. Find baby blue bird's mommy? No problem. Take Santa his gift? A snap. She shows that when you need help, you ask for it: Map, Backpack, & Boots are her constant side-kicks aka helpers. Dora's not afraid to ask for help when she needs it and that is an invaluable lesson. Especially for the daughter of two perfectionists with her own perfectionist tendencies. Are these dolls FP's way of trying to keep the ever growing (in years) Dora fans interested in their early childhood friend? Do the dolls come with the tagline, "Vamanos! Let's hit the rest room together so we can hold each other's hair back as we puke!" Because seriously, Dora looks like she needs to eat something. She goes from looking like a child to looking like the Latina Jon Benet. UGH! Can you tell how ticked I am at this? After reading the blog post, I sent an email off to my family reaffirming my wishes for a toy-less Christmas* AND a plea that if they do buy my daughter a toy, please do NOT buy her the new Dora dolls. 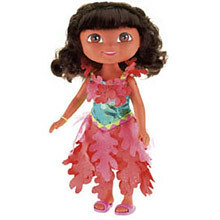 We have plenty of Dora dolls in the house, Dora can very easily wear frilly things without having to lose so much weight. I've written before about the sexualization of our daughters and I fear that the new Dora toys are playing right into this. It really is quite sad for me. The one cartoon (I count Diego in there too) that I felt was safe to go crazy with has turned on my daughter. What does it say to a 4-year-old who would get a new skinnier Dora doll? Don't they know that kids play with all their dolls together? "Hi chubby Dora, want to go to the mall?" Of course they do, but FP doesn't care. If they did, they wouldn't be putting out this doll. Gawd, this is worse that "I hate math" Barbie. This post will be cross-posted to my Chicago Parent blog, The Red Thread. *This is due to two reasons: 1) the toy recall insanity and 2) she has more toys than she can play with.